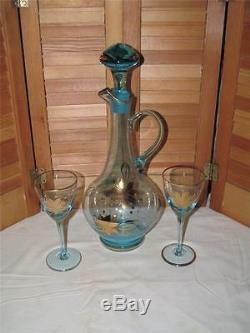 Vintage Murano Glass Wine Decanter W/Two Blue Wine Glasses With Gold Overlay. Vintage Beautiful Murano Wine Decanter 2/ Glasses Gold Overlay. This Is For A Beautiful Set Of Murano Glass. It Has A Very Pretty Wine Decanter And Two Glasses/Flutes With It. They Are An Aqua Blue Glass With A Gold Overlay. These Are Older But Are In Near Mint To Mint Condition. Decanter Measures; 15" Glasses; 6-1/2". If you have any questions or concerns just let me know. Check out my other auctions for GREAT DEALS. I have alot in stock. We strive very hard to provide 5-star service. If you are not happy with the items you have received, please contact me BEFORE leaving negative or neutral feedback and try and work out some sort of agreement Your business is much appreciated and are always available for answering any questions you may have. I sell antique, vintage and collectibles. I sell a variety of different, unique and rare hard to find items. Most all of my items come from Estate Auctions and are not new or always perfect and most generally may show some signs of wear. If there is a visible flaw or something out of the ordinary I will try and make sure to mention it the best I can from what I know about it. Sometimes I do not know a whole lot about some of the items so I do provide as many pictures of all angels as possible for you to view and consider them to be part of the item description. Due to the age of alot of these items and unexperience in them, I sell them as I get them. They are not pefect and may need washed, repaird or have a few stains. It is never our intention to misrepresent any item I sell. Certain images/photos incorporated into this template are the royalty free property of Karen's Whimsy Public Domain Images. The item "Vintage Murano Glass Wine Decanter WithTwo Blue Wine Glasses With Gold Overlay" is in sale since Tuesday, July 23, 2013. This item is in the category "Pottery & Glass\Glass\Art Glass\Italian". The seller is "purple_lace56" and is located in Osgood, Indiana.